I have a lot of time to think as I drive between our Ohio home and Harrisonburg, Virginia where our daughter and her family live. This trip was no different. Thanks to superhighways, the folded, old age mountain ridges and their accompanying deep gorges and valleys flipped by like shuffled decks of cards. The leaves of their mixed hardwoods already blushed tinges of autumn’s arrival. 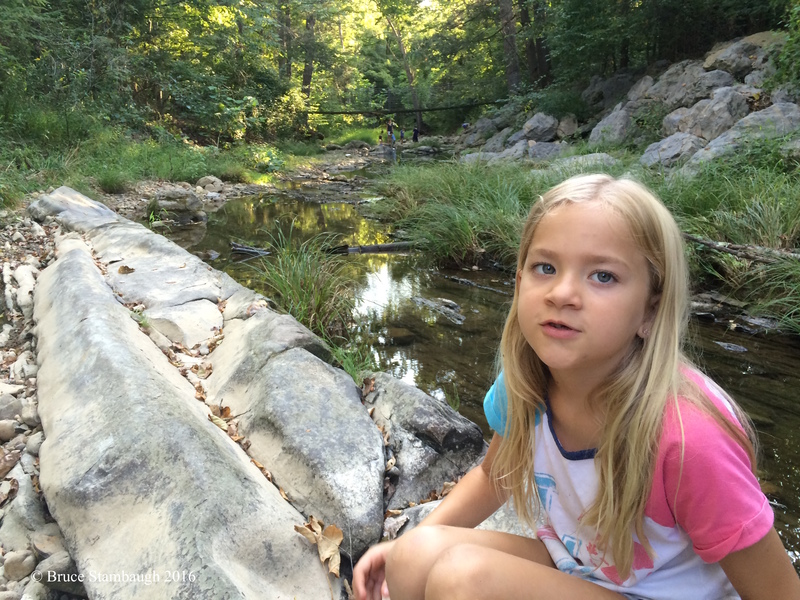 I thought about the lone, purple cottonwood leaf our six-year-old granddaughter plucked from a quiet mountain brook just a couple of days previous. She and I had spent an hour or more exploring, talking, questioning, and enjoying each other’s company in the shallow of a peaceful braided stream. I found Maren’s inquisitiveness as inspiring as our rural, mystical surroundings. Our interactive discussion included but was not limited to geology, theology, erosion, evolution, earthquakes, gravity, rock formations, and bird migration. I don’t know who was more perplexed, me with Maren’s significant, thoughtful questions or Maren with my confounding answers. Trooper that she is, Maren didn’t seem deterred. In fact, one response only led to another question, and another and another. I had the time of my life, sitting on these ancient limestone outcroppings, their striations complementing their angular positioning. Maren graciously accepted my academic explanation of how they came to be standing on edge after having once been the bottom of oceans eons ago. She’d continue her inquiry while simultaneously balancing along the exposed rock layers like a ballerina on a precipice. Patches of the early evening sky filtered through the broken canopy of the maples, oaks, sycamores, and cottonwoods that lined the rocky banks of Capon Run. 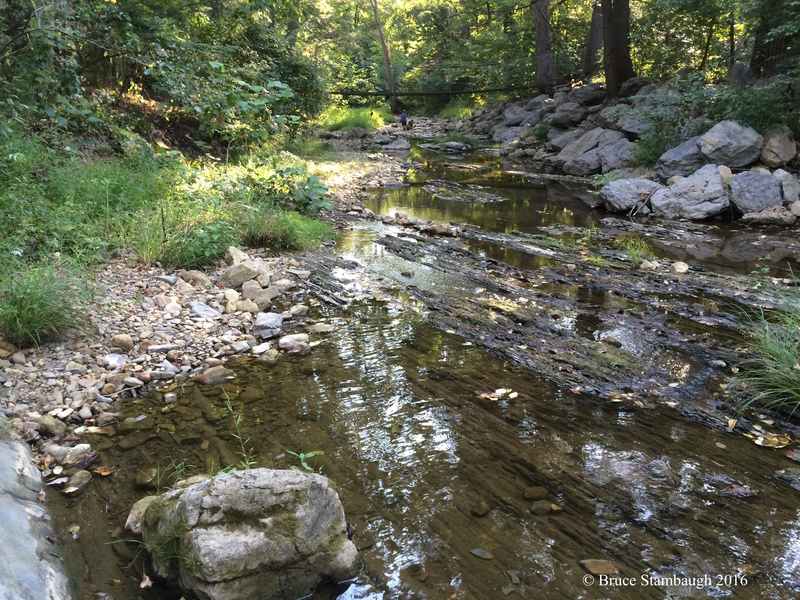 Despite the string of scorching days, the stream’s clear, quiet waters were cold. We watched water striders break the stillness of the mirrored surface as the spider-like insects foraged. 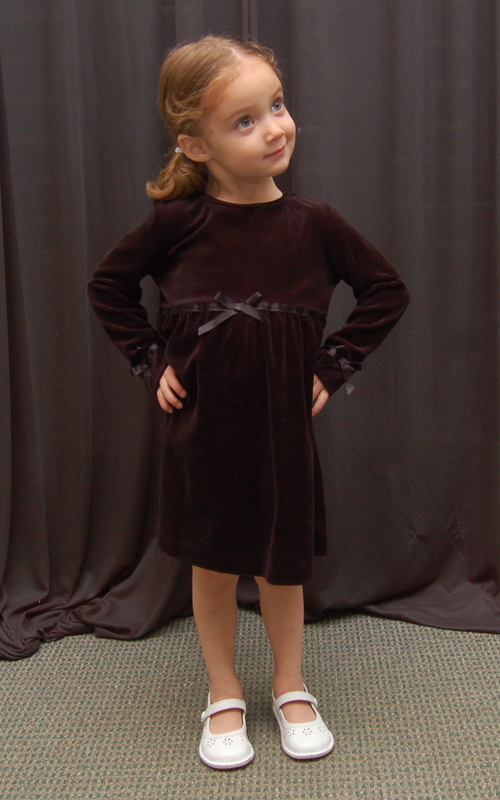 Then came the leaf, a rich, royal burgundy that caught the quick girl’s eye. Maren snatched it from its slow journey downstream, held it up, and asked what kind of leaf it was. I found its parent tree upstream and pointed it out to her. She nodded and released the leaf back to the placid water. I remember remarking to Maren how different that lone leaf was in color compared to the thousands of green ones that still quaked on the massive branches in the afternoon’s warm breeze. Maren liked that leaf, and so did I. I thought she’d keep it for its rarity. 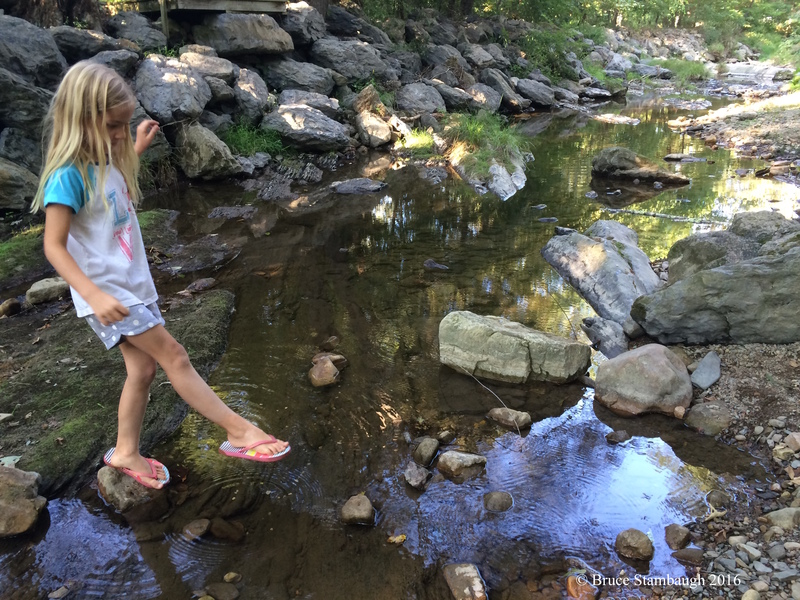 Instead, she let it go, enchanted with its slow twirling atop the crystal water, its impressive ability to avoid the creek bed’s rocks and sticks. I thought about that leaf, those moments with Maren again as I joined a congregate of others to celebrate and mourn the death of my wife’s cousin. As loving words poured out for Pam, it hit me that she had a lot in common with that glorious leaf. She, too, had lived a royal, purposeful life for her family, friends, and those whom she served as teacher, principal, and play director. For all who knew and loved her, Pam had fallen much too soon from the tree of life. 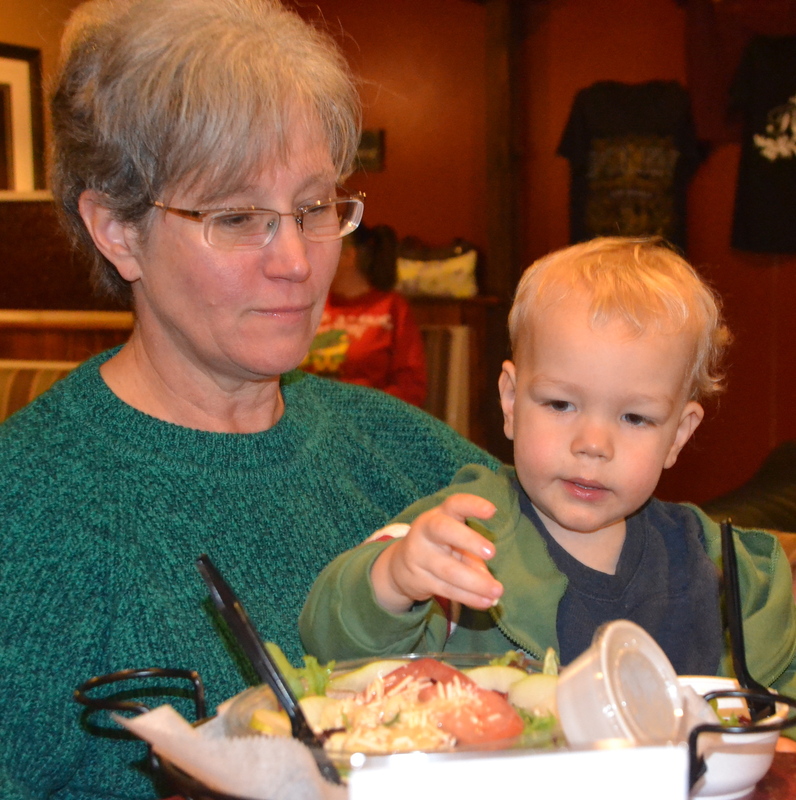 My wife and I are grateful for the creativity and joy our grandchildren bring to life. We are equally appreciative, like so many others, of Pam’s leadership and devotion to family, faith, and community. Just like Maren’s mauve leaf, we had to let Pam go, too. Joyfully her journey ended more blissfully than that serene mountain stream setting. My late friend, Perry Reese, Jr., knew a good thing when he saw it. Perry could read people like a newspaper. Best known as Coach, Perry scrutinized his surroundings similarly. That fact was one of the main reasons the talented and demanding teacher and coach loved living here. It was not easy for a single, black, Catholic man to reside and work amid the world’s largest Amish and Mennonite population. But he did for several successful years until his untimely death in 2000. Perry thrived here as a winning coach and as an asset to the entire area. Why? He embraced the same core values as those revered by local folks. Work ethic, faith, community, and family together formed his life foundation. Paramount to making Perry’s basketball team, players had to demonstrate a strong work ethic. The same characteristic holds for area businesses, too. Honing that esteemed value keeps the local economy healthy and stable, better than state and national averages. Perry was a very private person, including practicing his faith. But there was no question as to where Perry stood, and he impressed that on his players. 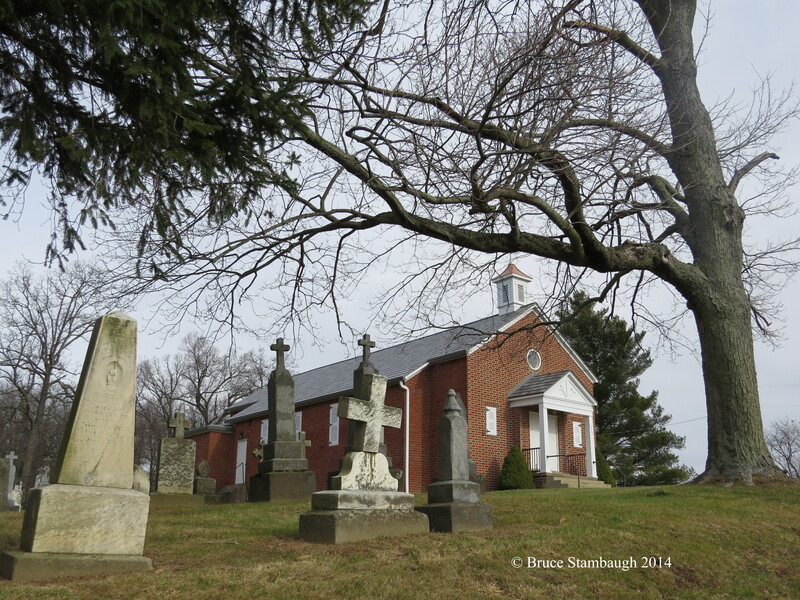 St. Genevieve Cemetery and Parish. It’s fair to say that local businesses attempt to model that approach with their products, services, employees and customers. The goal: actions match beliefs. Perry loved the community, and for the most part, the community charitably returned the affection. He knew the importance of positive interactions and interpersonal relationships. 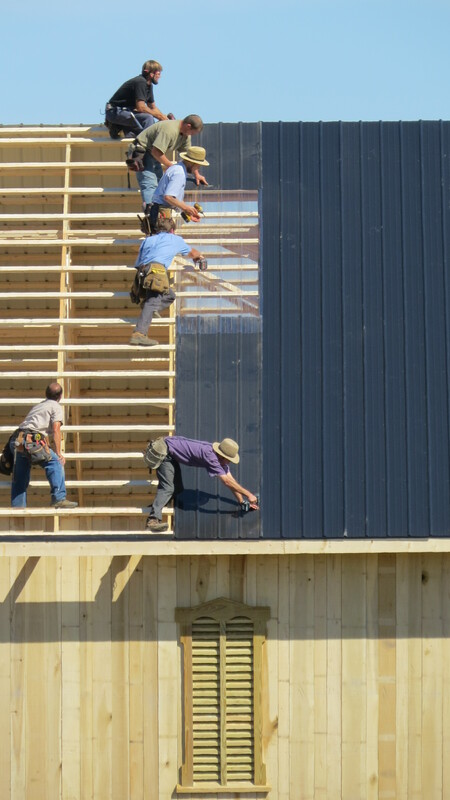 It takes determined effort to work together for the common good in a close-knit community. 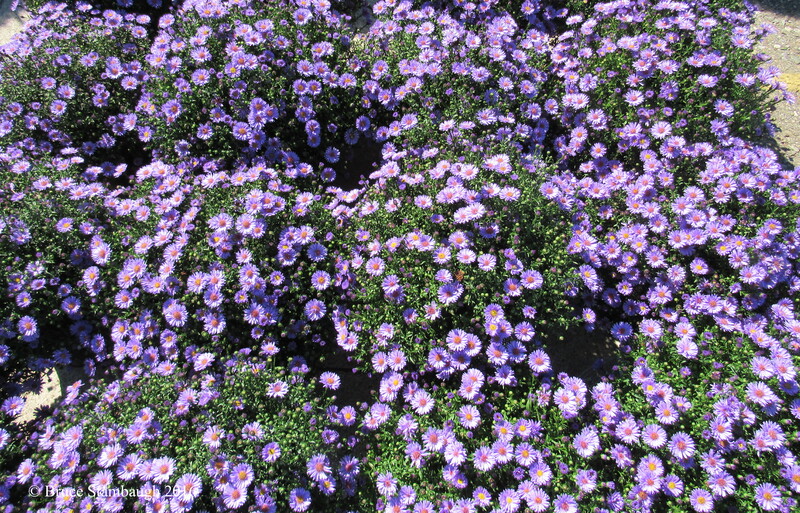 Though not perfect, this area shines in this regard. 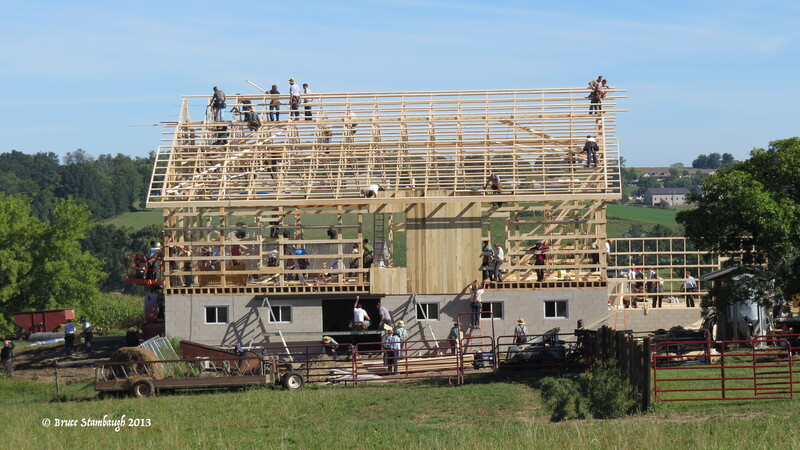 Individuals, groups, clubs, churches and foundations regularly join forces with businesses to assist in time of need. 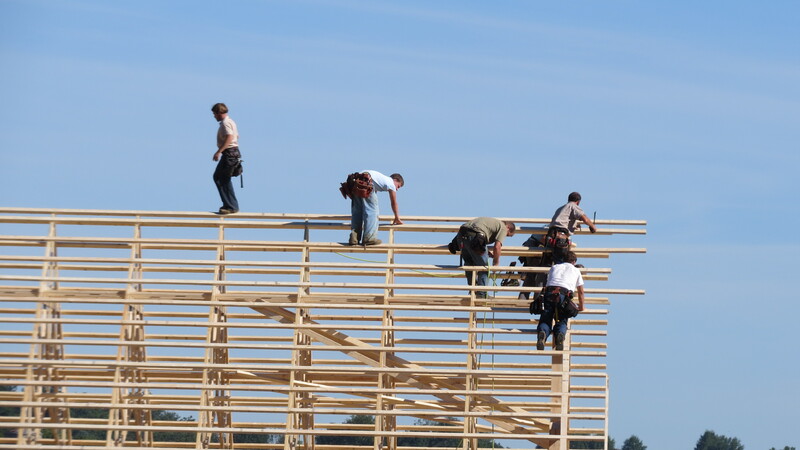 Share-A-Christmas and the new county fairgrounds are two examples that come to mind. Add in the multitude of benefit auctions for individuals and service organizations, the commitment to community speaks for itself. Despite his singleness, Perry placed enormous significance on the importance of family. In fact, he considered his players his family, and many considered him a father figure. The fact that so many local businesses are family-owned and operated mirrors that concept. Family is everything here. Any and every good excuse is used to gather the family together any time of year. Birthdays, holidays, anniversaries, even solemn holy days like Old Christmas and Ascension Day, families assemble to share and commune. That’s not to say some good old-fashioned ribbing and recreation won’t also ensue. Gathering of family and friends. In that same vein, businesses also reward their employees with family days like picnics, destination trips for the entire family, and financial bonuses. After all, a son or daughter might just be part of the next generation of employees. All that said, it doesn’t mean that businesses and owners set themselves on a higher plane than elsewhere. Nor does it mean mistakes don’t happen. They do. But incorporating these four essential core values creates productive consistency in both corporate and individual lives. Another admirable quality, humility, ties these four values together for individuals and businesses alike. 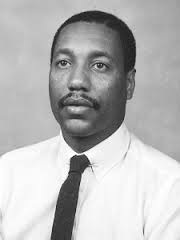 Perry Reese, Jr. successfully used that important attribute to bind his teams together as one, just as businesses strive to keep their faithful employees. 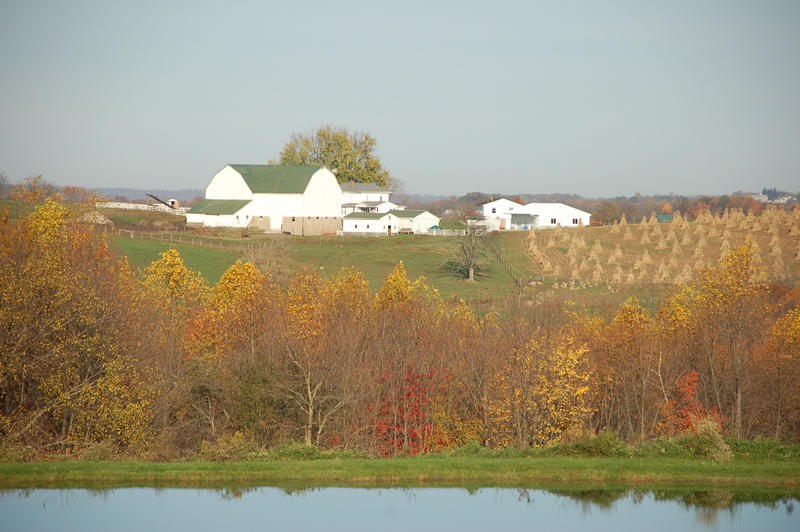 These four fundamental principles have been time-honored traditions in Holmes Co., Ohio. In truth, they are revered universal values that transcend any and all geographical, social, political, gender, religious or cultural boundaries. Friend to many, Perry Reese, Jr. was a gem of a guy, who humbly modeled the community’s core values. To do so was simply smart business. We had just turned out the lights for the night in anticipation of a really good night’s sleep when we heard the sirens. With the windows open on this warm and wonderful August evening, the sirens grew louder as they quickly approached. I headed to the dining room to look north out the windows. Above the stand of giant field corn an eerie dancing orange glow lit up the night sky. We had a big fire somewhere in the neighborhood. I got dressed as quickly as I could, grabbed my cameras and headed to the garage. In the meantime, my wife had ventured out into the front yard. 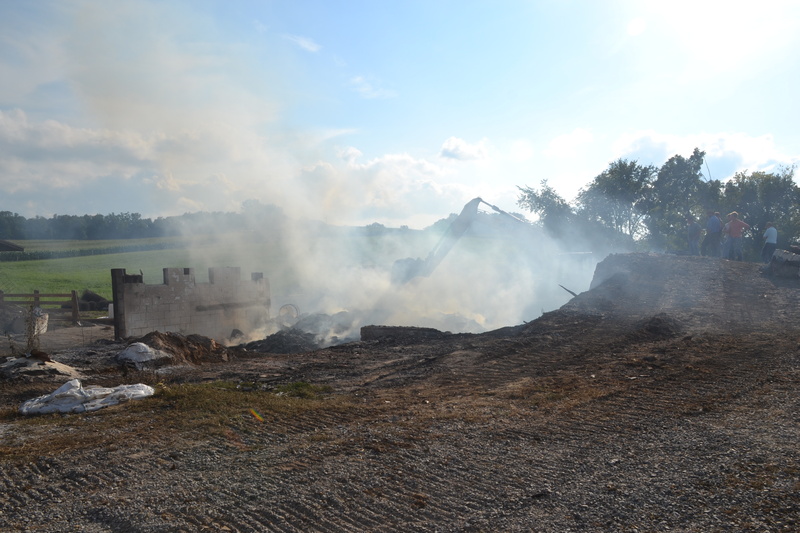 She reported back that it was either our friend’s excavating business or the neighbor’s barn that was burning. Once the parade of responding fire vehicles passed by, I pulled my car onto the road and quickly saw that indeed it was our neighbor’s barn. It was fully involved in flames. 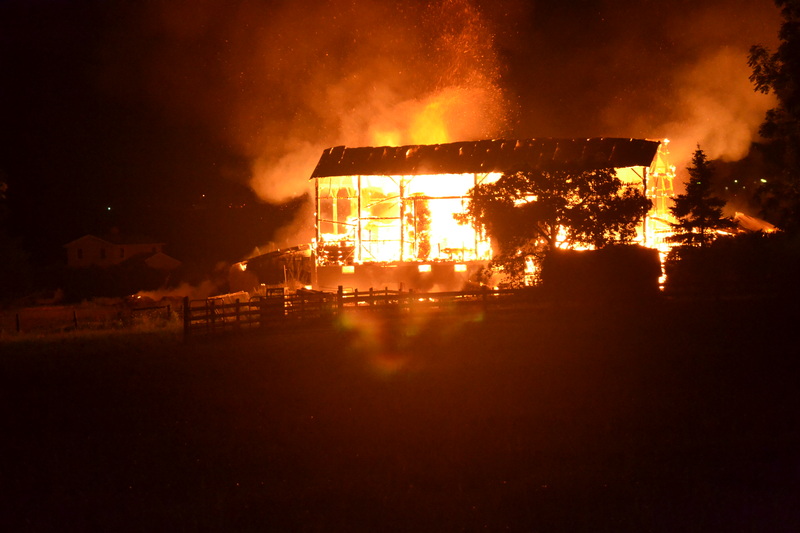 Only the sheet metal roof remained, held up by the century old timber frame, dark against the constantly changing fiery kaleidoscope that was quickly consuming its host. 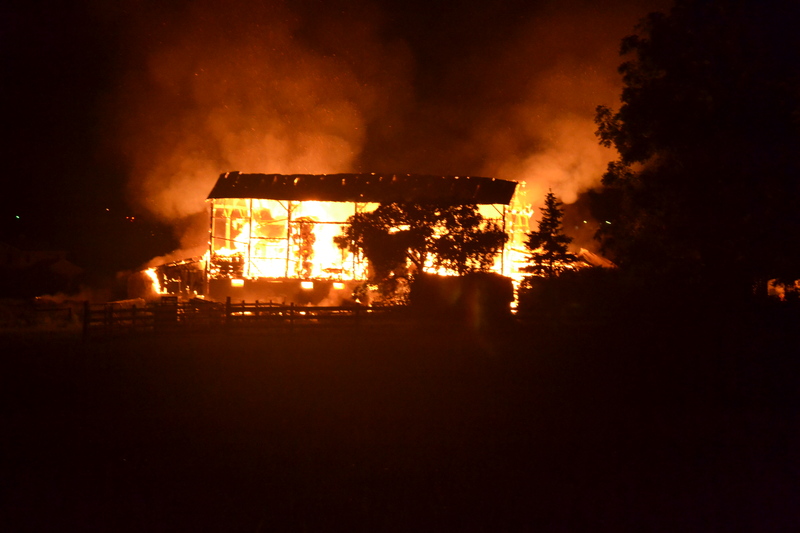 With the barn that far gone, the firefighters executed their only logical option. 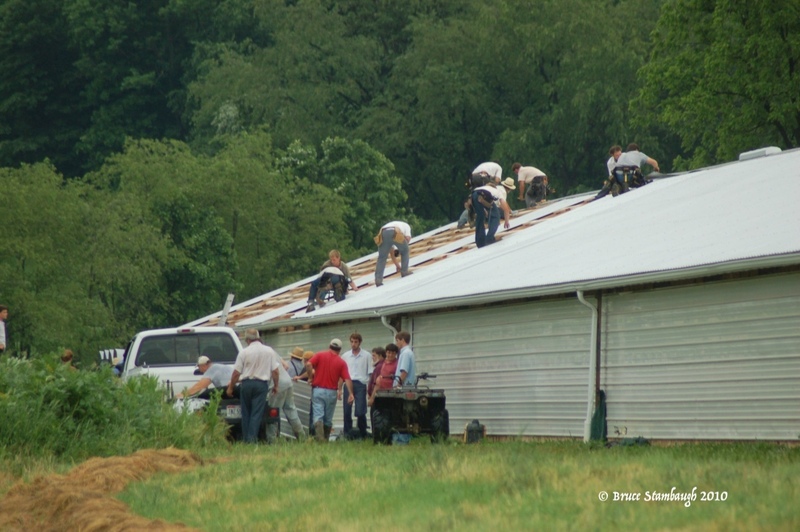 They concentrated their hoses on protecting the other exposures situated around the old bank barn. Soon long streams of water played back and forth dousing the rooftops, cooling them from the ferocious temperatures generated by the destructive flames. My first instinct was to see what I could do to help directly at the scene. Knowing I’d only be in the way, I instead pulled into my excavator friend’s parking lot, focused my cameras and started snapping. I wasn’t alone. Scores of others joined me. Tractors, vans, cars, pickups and bicycles filled the parking lot. Most spectators, like me, were lined along the wire fence that separated a farm field from the parking lot a football field from the blaze. I photographed the various stages of the fire. Just 11 minutes after I had taken the first picture, the roof succumbed to the inferno. Embers of burning debris cascaded high into the dark sky, carried aloft by a steady south wind. With the barn completely collapsed, I walked down the road to console the owners and to talk with firefighters that I knew. I was amazed at both their numbers and their efficiency. Normally, rural areas are hurting for volunteer firefighters. This night, so many men and women in turn out gear or auxiliary smocks had responded to the alarm that they had to take turns spraying water or offering food and drink. The response for this emergency was tremendous. It was an impressive display of community service. 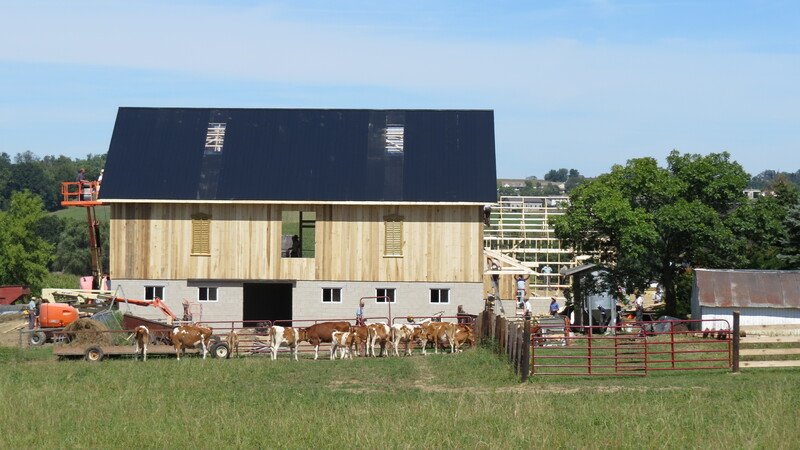 In addition, a gallery of onlookers congregated close to the old farmhouse. Most were family, friends and neighbors who had come to see if they could help in any way. Many had arrived before the first fire engine. 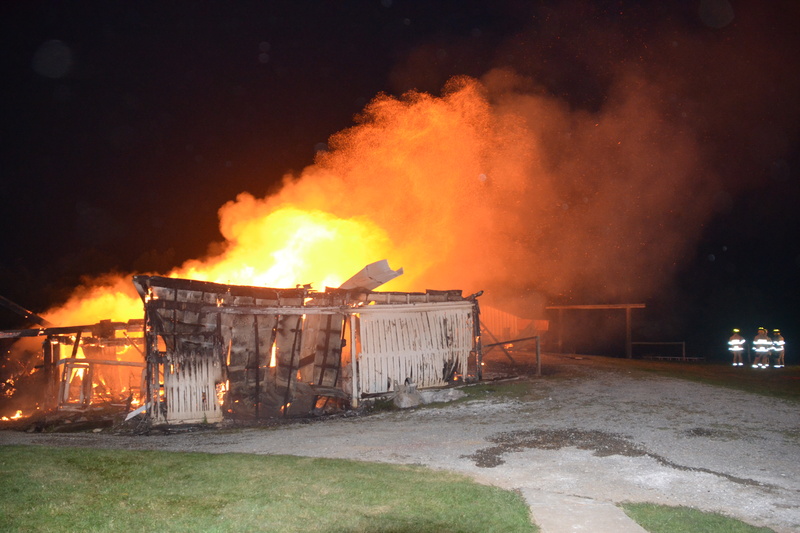 In less than an hour, the bank barn was reduced to burning hay inside of charred basement walls. I took a few more photographs and spoke with the owners. Everyone was fine. 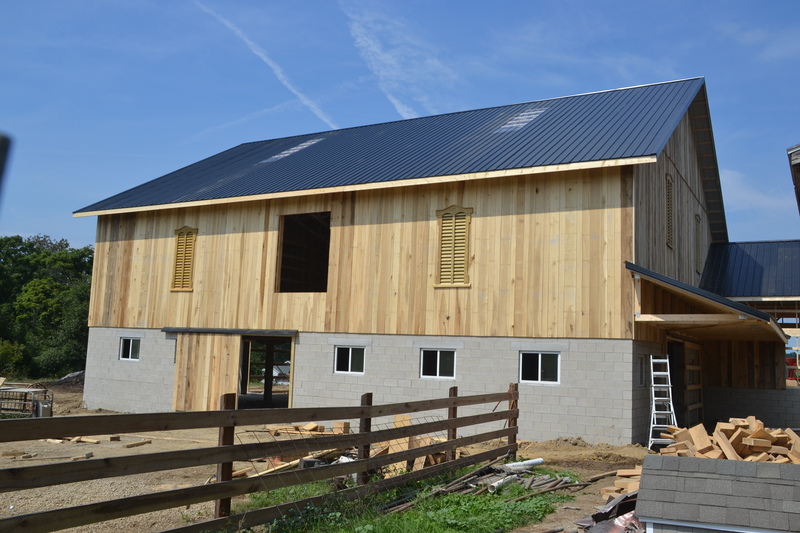 No animals had been harmed, and most of the equipment had been removed from the barn just that day. 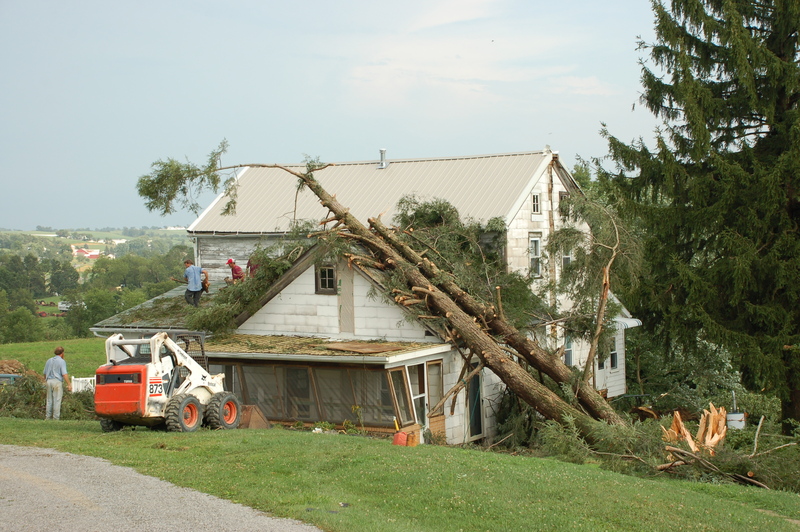 The only losses were the barn, its storehouse of hay, and personal cultivated memories. 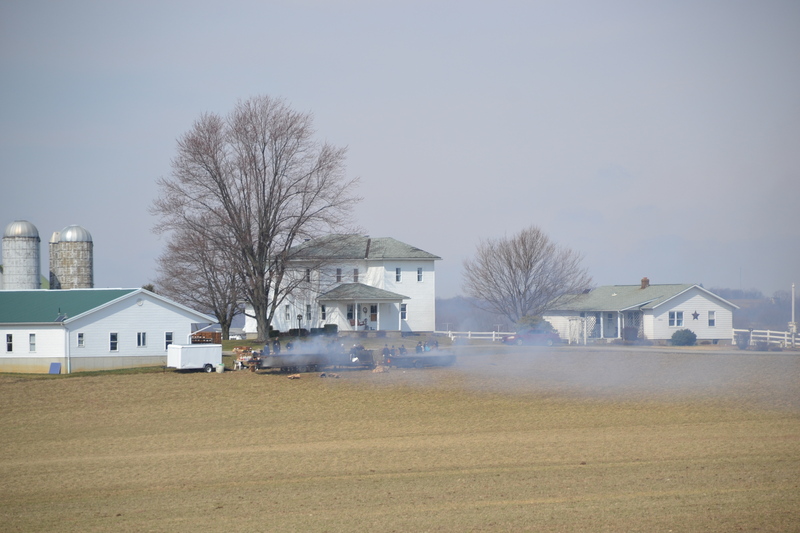 Amish church insurance would compensate for the material losses of the accidental fire. 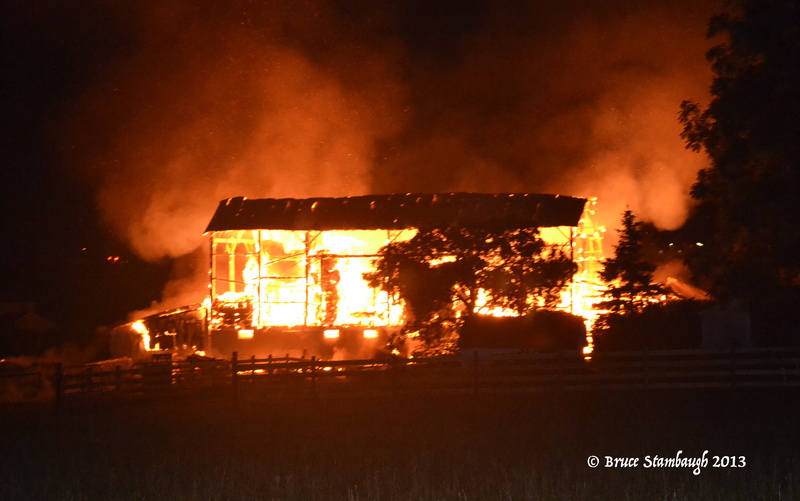 The origin of the fire was either from wet hay or sparks from an unattended burn pile several feet west of the barn. I was sad for my neighbors, but heartened by the many people who came to help. A crisis can test the mettle of a community. This August night, its people showed their stuff. 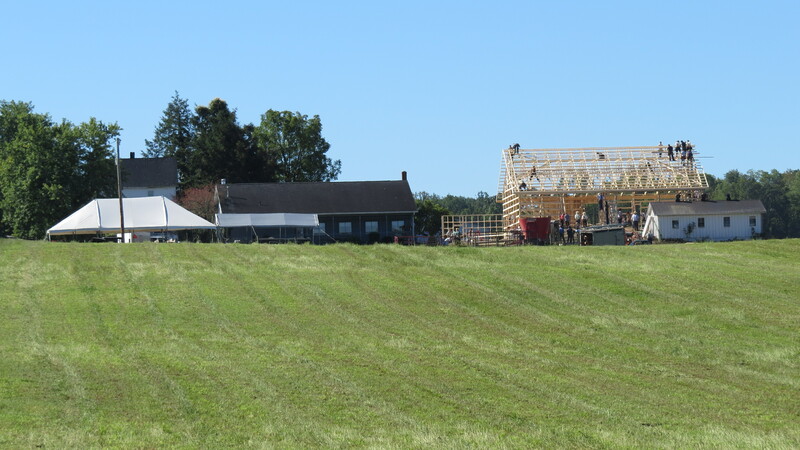 The clean up began the next day amid the ruins of the smoldering barn. 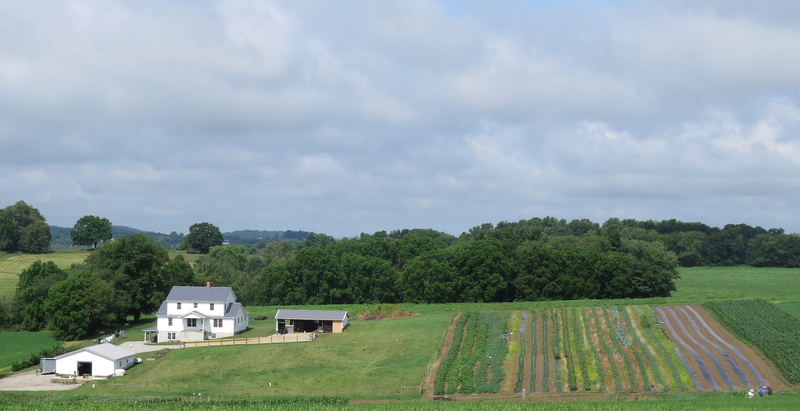 I drove by this Amish produce farm on the way to and from the pharmacy. I happened into the local pharmacy mid-morning to purchase a few items I needed. It turned out to be much more than a routine shopping trip into town. The clerk at the checkout counter was a former student in one of the buildings where I had been principal. Normally, upbeat and cheery, I mentioned that she seemed a bit down about something. The young woman replied that the store had been robbed of drugs the previous evening, and that she was still a little jittery from the experience. I expressed my regrets and sadness to her. I told her that my own parents and my wife’s parents had each had been robbed. In the aftermath, they felt violated, insecure and wary. The young woman said she felt the same. Just then another employee arrived and joined the conversation. She, too, had a school connection. She was an employee, and I had her son as a student. 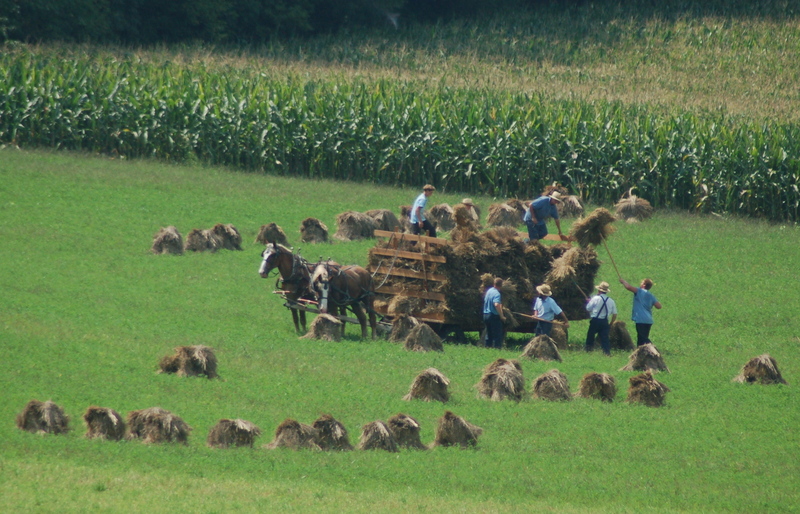 The scene reflects the lifestyle in Amish country. Though crimes do occur from time to time, the perpetrators are usually caught and convicted. The women told me that law enforcement officials had arrived quickly, and through the help of witnesses and their police dog, the alleged perpetrator had been caught. Still, I could see the fear in their eyes and hear the quiver in their voices. At that point, another customer arrived at the checkout counter. Yes, she, too, was another former student. I recognized her and her freckles, but had to ask her name. I told Heidi she hadn’t changed, and she said I hadn’t either. I told her to get her glasses checked, and we all laughed. Given the circumstances and the setting, it was fun just to share a bit of laughter. The kibitzing we did back and forth helped them forget the robbery. We are fortunate to live in a community where criminal acts are the exception and not the rule. Like my friends at the drug store, we are all connected one way or another. I think this familiarity with one another develops a certain resiliency with folks. My neighbor’s business was broken into. Another neighbor had a valuable deer stolen. Local banks have been robbed, and on and on it goes. Fortunately, these various incidences happened over a long period of time. There are times when the thoughtless desperation of others interrupts our normal life. And yet, a new day dawns and we go on with our everyday business, trusting, hoping, and praying that all will go well. 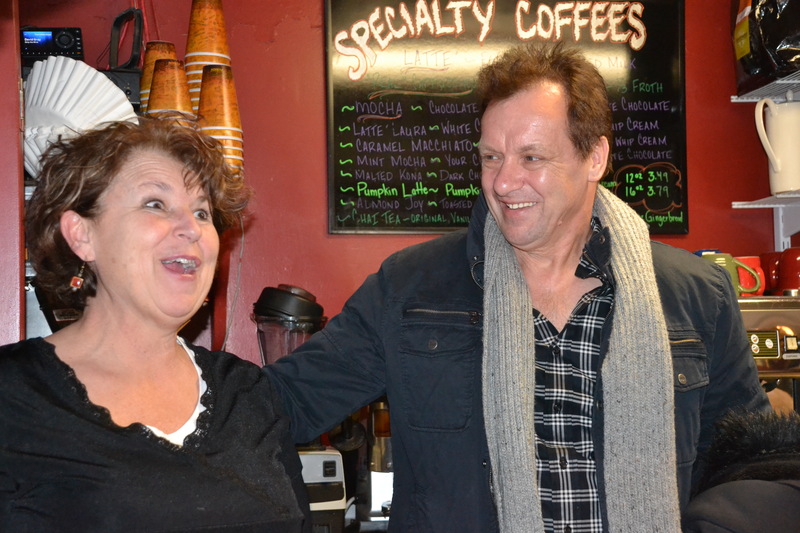 Smiles are generally the rule in any Holmes Co. business. When you live in a community where many people know one another through friendship, work, church, school, neighbors or are related, you tend to feel safe. You also feel connected. 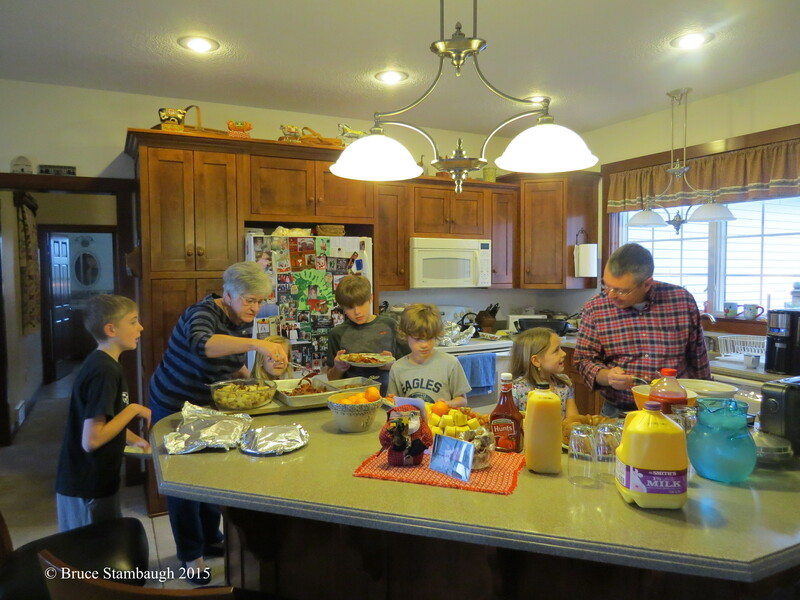 A friend of mine, long since gone, once hosted her grandchildren who lived in a metropolitan area in another state. When it got dark, one of the grandchildren asked if she was going to close the drapes since people passing along the busy highway could see in. Her reply to the simple question was a life lesson for her grandchild. There are times when others will take advantage of us for such thinking. But if that happens, friends, neighbors, coworkers, relatives and former students will help us in our time of need. Sometimes that help simply comes in the form of a little spontaneous laughter that helps keep us connected to one another. In the case of my friends at the pharmacy, the smiles and the laughs in the face of fear were treasures no robber could steal. Tagged as community, connected, connecting, connections, fear, Holmes County Ohio, humor, relationships, robbery. 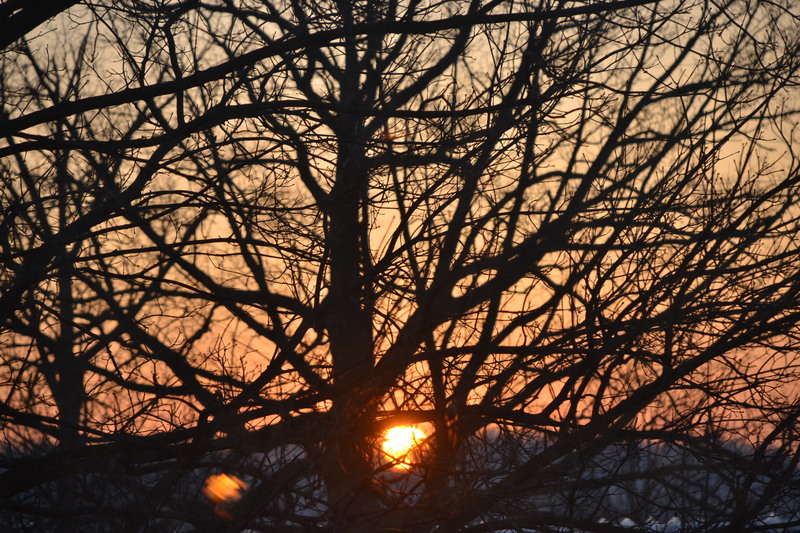 Benefit Saturday began with a beautiful sunrise. This was to be benefit Saturday for my wife and I. I simply couldn’t have projected just how beneficial it would end up being. Before dawn a delightful aroma wafted across the landscape from the Amish farmstead behind our rural Millersburg, Ohio home. A congregation of people was barbequing chicken on portable grill wagons. A generator cast a harsh, artificial light upon the busy group, creating predawn silhouettes. The benefit barbeque was for a couple that needed financial assistance due to extreme medical bills. She had cancer, twice. He had had surgery that kept him off of work for six months. To help out, we ordered six quarters of chicken to be picked up after 11 a.m.
That was but one of three different fundraisers in which we participated that day. The first began at 7 a.m. with sausage, ham and pancakes. My wife ate the meat. I ate the pancakes. The breakfast was held to raise money for a mission project in Mongolia. 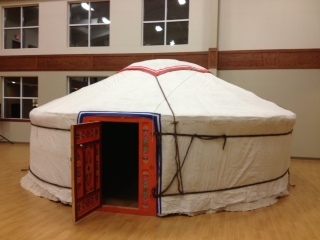 An authentic, completely furnished Mongolian ger, a felt lined hut, had been erected in the church fellowship hall for all to inspect. As tasty as the food was, the fellowship that buzzed around our table was even better. We reminisced with old friends about how our lives had intersected during the ups and downs of life. Breakfast doesn’t usually come with dessert, but that’s what this conversation ended up being. Though the chicken cooking was literally in our back yard, we had to pick up our order at a residence a mile up the road. For lunch, Neva and I each downed a quarter of the flavorful hinkel, as the Amish refer to it. We enjoyed the chicken so much I returned to buy more, only to be told that they only had enough to fill the presale orders. Our Amish neighbors hosted the grilling of the barbequed chicken. I drove back my neighbors’ long graveled lane to where the chicken was being grilled. I got the same answer there, but discovered the full measure of devotion of this gracious act of charity. More than 80 friends, family and extended family members gathered to do the chicken. A total of four tons or nearly 8,500 quarters of chicken had been barbequed to sell on behalf of this family in need. The charcoal was lit at 5 a.m. The grilling began at 6 a.m. and finished up at 2 p.m. It was an all day deal. From the looks on the workers faces, they were both elated at the success of their selfless efforts and fatigued from their long hours of hanging around the smoky grill pits. 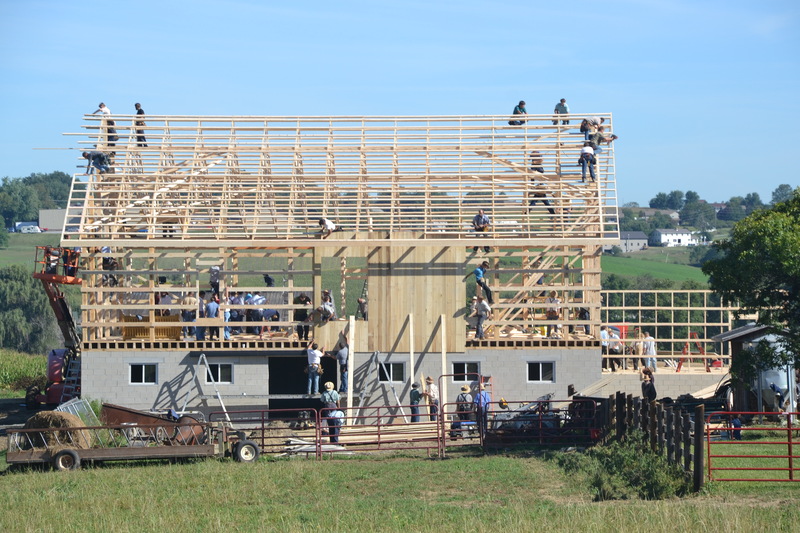 A total of 36 Amish churches helped sell the chicken, and they indeed sold it all. They may have barbequed lots of chicken, but in the process they also cooked up a liberal batch of compassion. 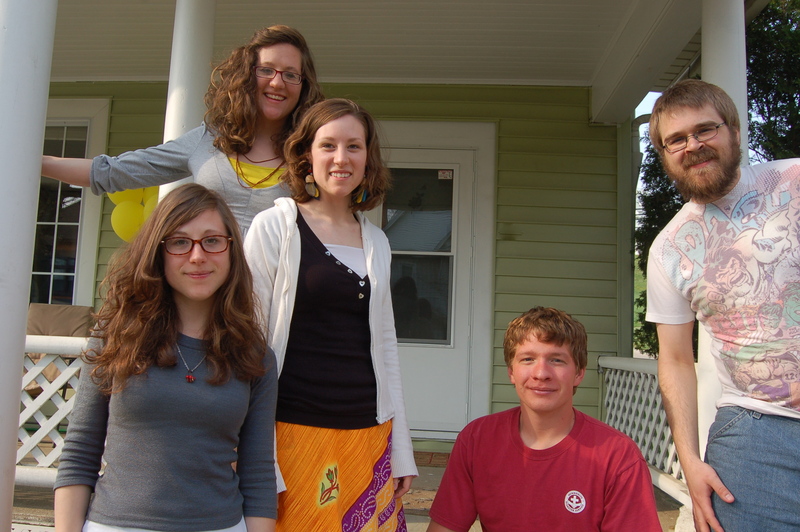 The band, Honeytown, performed at a local coffee shop to help raise money for our church youth group. In the evening, Neva and I headed into town for a concert by a renowned, local quartet. 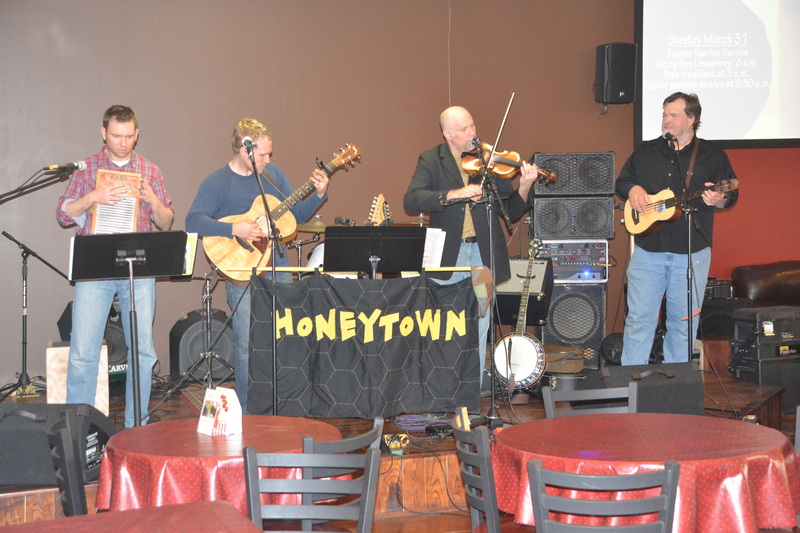 Honeytown sang and played as a fundraiser for our church youth group. 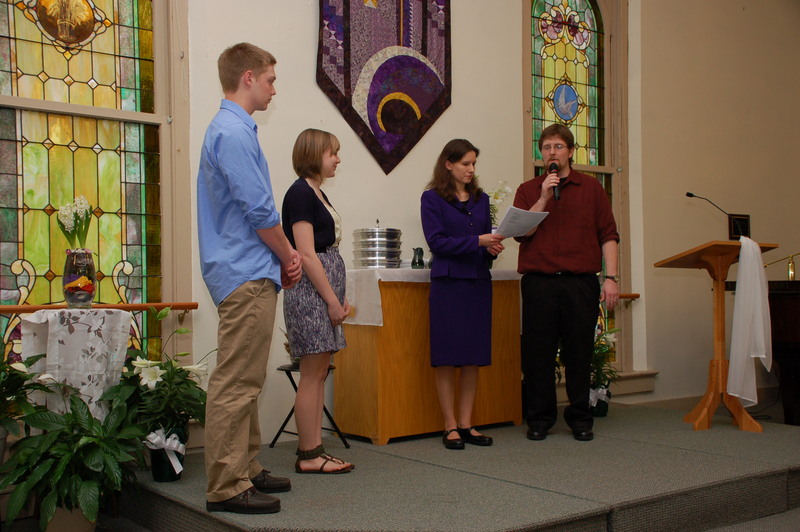 The kids were raising funds to attend a church wide conference in Arizona this summer. 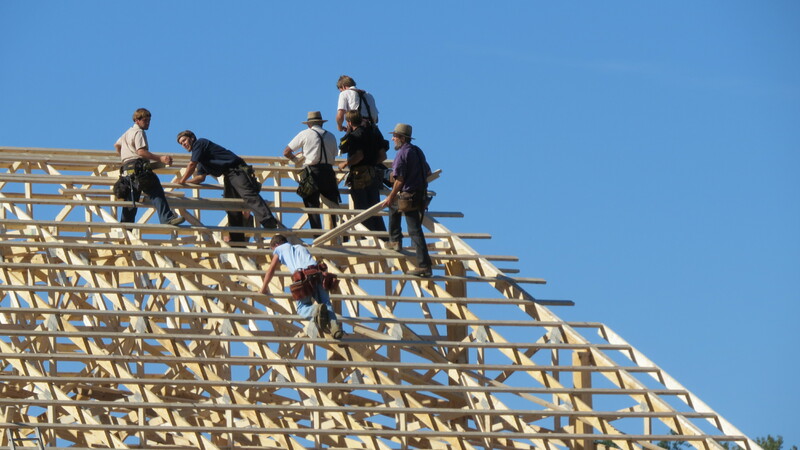 Only Mennonites would hold a gathering in the desert in July. Each of these three benefits had a specific purpose, and each achieved success. Love comes in many shapes, sizes, and means, pancakes, barbequed chicken, and inspirational song among them. Though independent of one another, a common purpose and generous acts of human kindness bound the benefits as one. We had been thrice blessed. Beneath an umbrella of golden sun and cloudless coral sky, this benefit Saturday had truly been extraordinary. Kids of all ages inspire me. I guess that had something to do with honing 30 years in public education. It also motivates me to help award scholarships at the end of each school year for the Holmes County Education Foundation if I can. This year my schedule was free. Once again I found myself seated with several other presenters facing the 2012 graduating class of West Holmes High School, Millersburg, Ohio. Like the others who announced scholarship winners, my job was a simple one. I merely had to read off the names of the recipients of two different memorial scholarships of two of my very best friends in life. Prior to their deaths, Paul Sauerbrey and Helen Youngs had established the scholarships so that youngsters from future generations would be encouraged to further their education beyond high school. Over the years, the financial assistance has helped dozens and dozens of area students attend college or trade school. I’m always impressed with how well behaved the graduating seniors are. For them, high school is over. They could be off celebrating. But on a beautiful late spring evening, most of the 179 seniors were on hand to accept a simple certificate awarding them their grant. In some cases, students earned more than one scholarship. Unlike the caricatures too often portrayed about teens in the mainstream media, these young people are polite, thankful and eager to move forward with their lives wherever that may be. Sure, some of them wear flip-flops while others clop to the stage in high heels. More creative, free-spirited graduates don expressive attire. One kid once came dressed in pajamas. Nevertheless, the students understand the significance of the situation. In many cases, like my two friends, the money is given in the memory of someone. Several are memorial scholarships named for loved ones who died tragically or unexpectedly. Prior to announcing the scholarship recipients, I take the opportunity to inform the students about Mr. Sauerbrey and Ms. Youngs. Perhaps this is my teacher instinct still coming out. Mr. Sauerbrey and Ms. Youngs each were persons who made a huge difference in life, not just for me, but also for the entire the community. I wanted to put some flesh and bones and spirit with the names of the scholarships. The students listened attentively. Both Mr. Sauerbrey and Ms. Youngs were instrumental in the daily activity of Killbuck, Ohio, the village in which they lived most of their lives. Mr. Sauerbrey taught at the elementary school for most of his 43-year teaching career. Ms. Youngs worked at Killbuck Savings Bank for 55 years. She also served as the town treasurer for 43 years, and loved to play the organ and sing in the choir at Killbuck Church of Christ. Previous scholarship recipients have made a difference through their chosen careers. Some have become teachers, doctors, lawyers, bankers and mechanics while others operate their own businesses. Given the grace, respect and appreciation the 2012 graduates showed in accepting their scholarship awards, I expect they will succeed as well. What really caught my attention though was the support and geniality that the graduating students showed to each other. They truly seemed to care for one another. If that positive attitude persists in life, these graduates will likely make a difference whatever they do and wherever they land. Mr. Sauerbrey and Ms. Youngs would be very pleased indeed. It’s no accident that buggies, pedestrians and bicyclists are easier to see when traveling the hilly and curvy roads of the area. 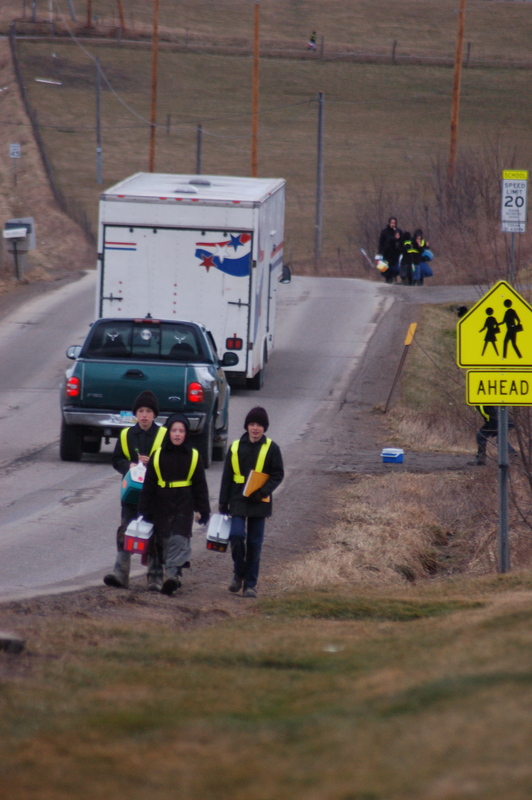 Pedestrians, like these Amish school children, are much more visible since they started wearing day glow vests. 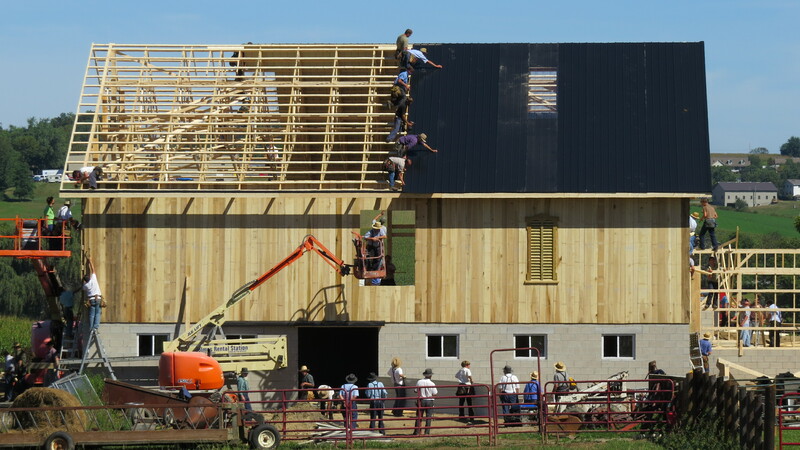 The Amish Safety Committee, made up of three Amish men, has been working for 18 years to educate their constituency on road safety. The most recent focus has been on improving visibility. 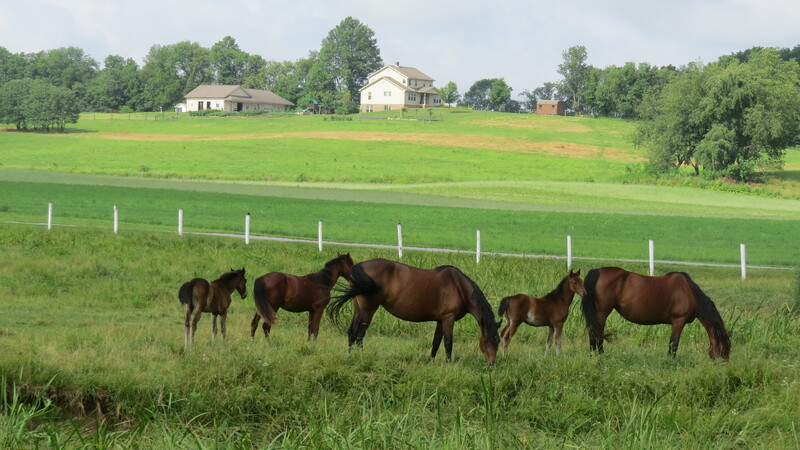 Drivers who frequent the Amish areas of Holmes, Wayne and Tuscarawas counties can literally see the impact the committee has made. Recognizing the importance of being seen, lighting has been the biggest improvement. 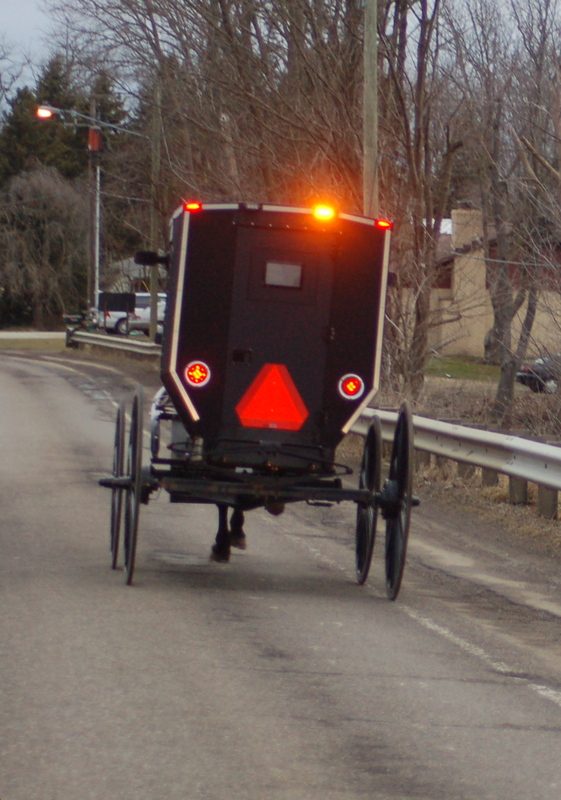 In addition to the required slow moving vehicle orange triangle on the rear of the buggy or cart, most horse-drawn vehicles are now well lighted. 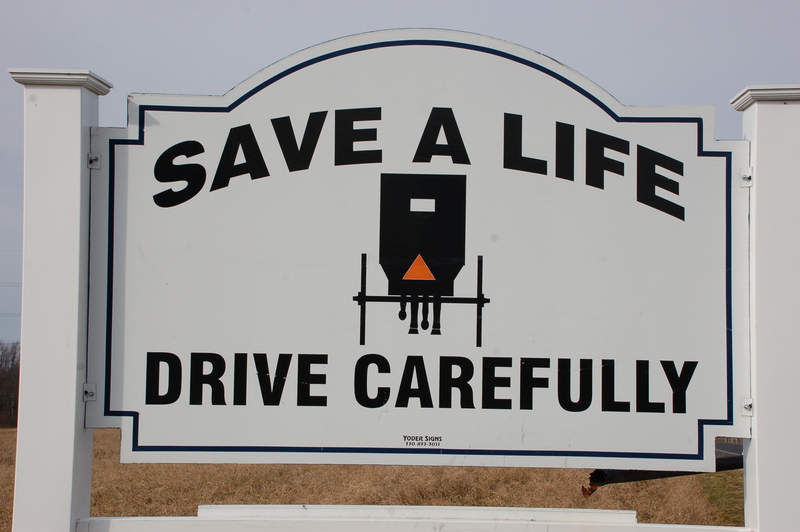 “The biggest factor in most car/buggy accidents is speed,” said Wayne Hochstetler, of rural Millersburg, and a member of the safety committee. “Drivers just can’t judge how fast they come upon a dark colored buggy.” Church rules stipulate that buggies be black in Ohio. 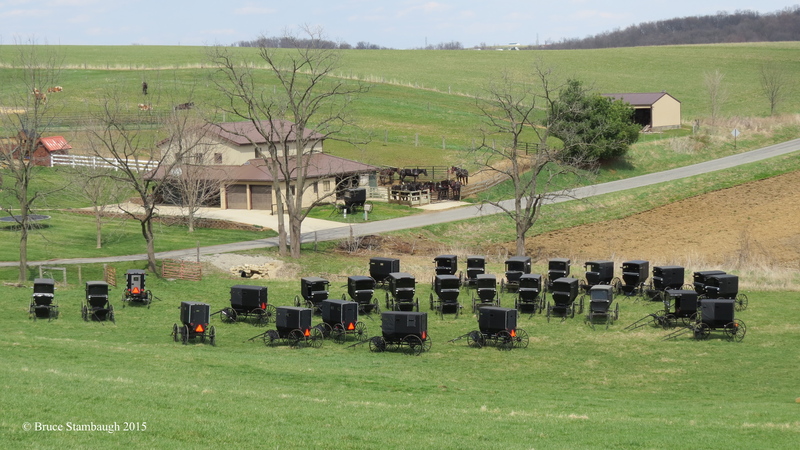 Amish buggies, like this one in Holmes Co., OH, are much easier to see thanks to improved marking and lighting. 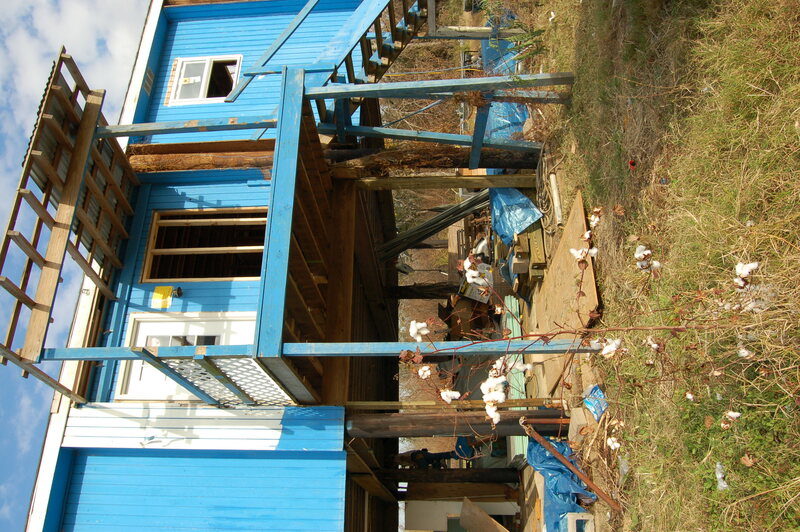 “The biggest help has been the blinking amber light,” Hochstetler said. The light is usually centered at the top of the back of the buggy. It operates on batteries, and some models even provide varying blinking patterns. “The blinking light tells the driver that a buggy is ahead sooner than the triangle does,” Hochstetler said. The committee has suggested other lighting for buggies as well. “We encourage people to use taillights and running lights for both the front and back,” Hochstetler said. Rear lights are imbedded in the body of the buggy, while running lights are on both sides of the buggy. The rear lights are red, just as they would be on a motorized vehicle. The running lights serve as a form of headlight, although, according to Hochstetler, they are used more to be seen than afford light for the buggy operator to see. 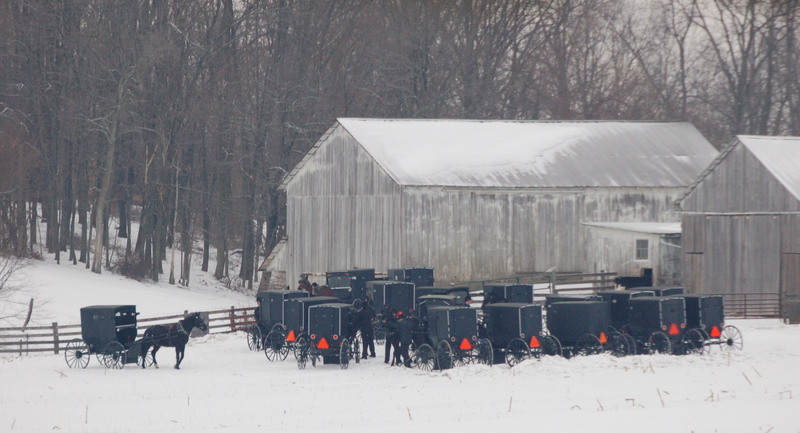 Amish buggies are marked with Slow Moving Vehicle orange triangles, reflective tape, and lights. 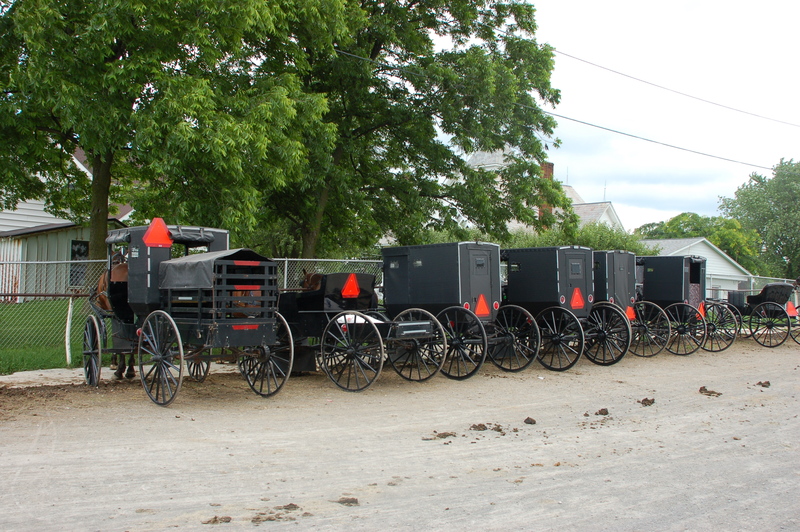 How they are marked is determined by the church district to which they belong, or which sect of Amish, like the Swartzentruber buggy with no SMV. In addition, smaller lights are often used on the top front of the buggies, too. These are white, amber or sometimes blue, though law enforcement discourages the latter. Most of the new lighting is LED lamps, which create a brighter, easier to see light. Most buggies also have white reflective tape that outlines the back of the buggy. The illumination improvements haven’t been confined to horse-drawn vehicles either. Many pedestrians and bicyclists now wear reflective and lighted vests for easier visibility. Like the buggy lights, the lighted vests blink at night. Some walkers use LED lamps attached to their hats in order to be seen by oncoming traffic. Bicycles also use red blinking taillights and bright white headlights. Reflective straps are also used around horses’ ankles and on the shafts of the buggies to which they are hitched. This permits reflectivity from traffic approaching from the side. Drivers of all kinds are reminded to drive safely in Amish country. 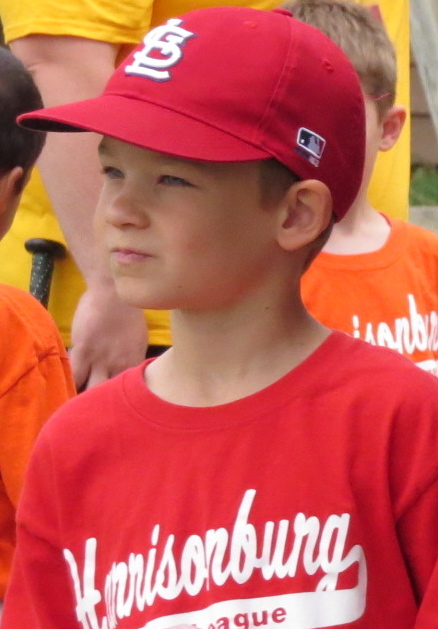 Besides Hochstetler, other committee members are Gid Yoder and Rueben Schlabach. Detective Joe Mullet, of the Holmes County Sheriff’s Office, and Lt. Chad Enderby, of the Wooster Post of the Ohio State Highway Patrol, serve as ad hoc advisory members. 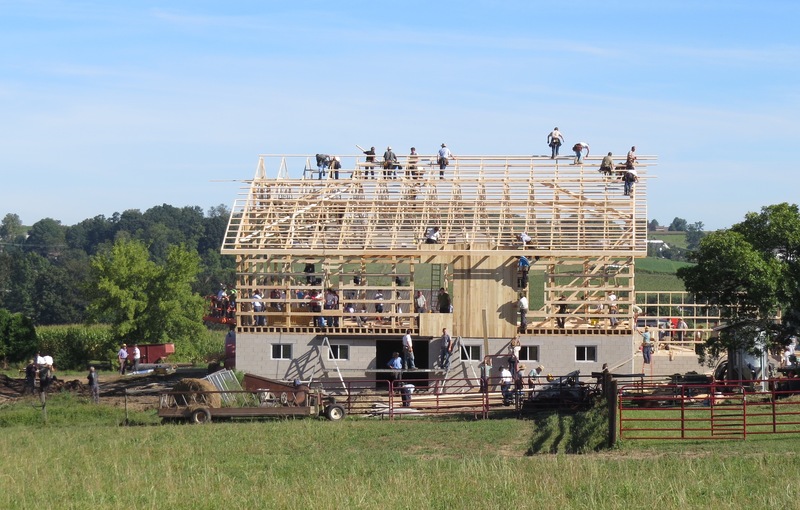 Hochstetler said that the grassroots efforts of the committee have been so well embraced by the Amish in Holmes, Tuscarawas and Wayne counties that they have been invited to help form other safety committees in other Ohio Amish communities. “We have even been asked to share in other states like Indiana, Michigan and New York,” Hochstetler said. Mullet said that even the Swartzentruber Amish, the lowest order of the sect, are now using two lighted lanterns with front and rear lens. They formerly used only one. 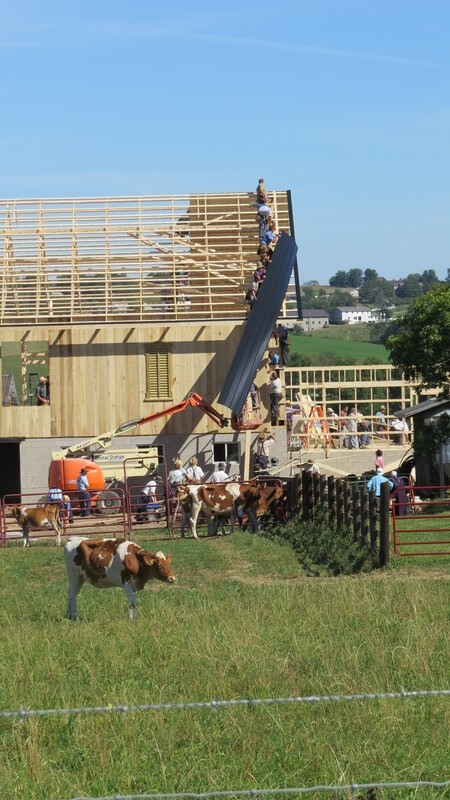 Mullet said that he spends several days a year visiting Amish parochial schools to teach the students practical safety measures. They include the proper way to walk and ride bikes to and from school, and encouraging wearing the day glow vests. Mullet said he often tells personal stories to make it more meaningful for the students. Mullet also has an advantage in keeping the students’ attention since he can speak Pennsylvania Dutch with the students. 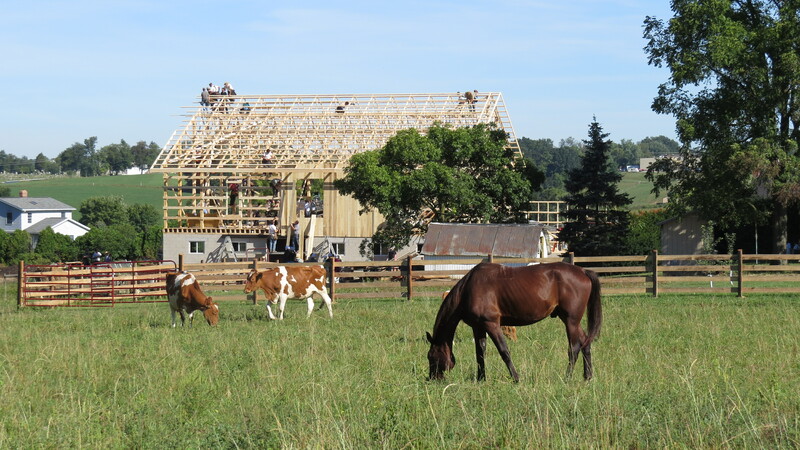 In addition to being proactive on safety, the Amish for several years have paid a self-imposed donation to the Ohio Department of Transportation to help improve area roadways. 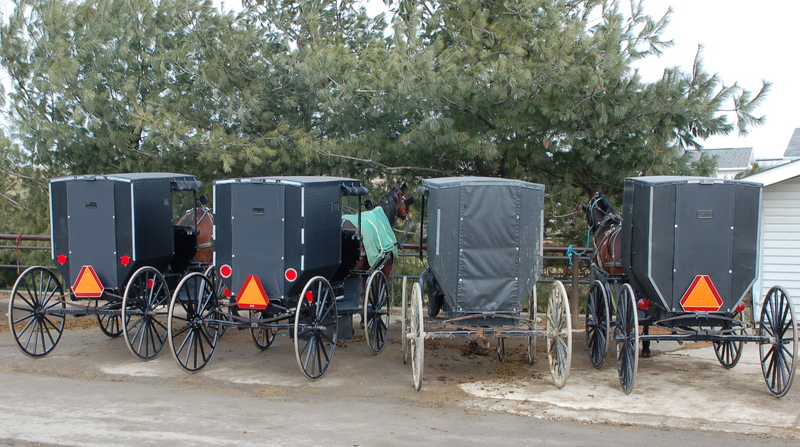 Hochstetler said each church district has a person designated to annually collect donations for each horse-drawn road vehicle owned by the household. 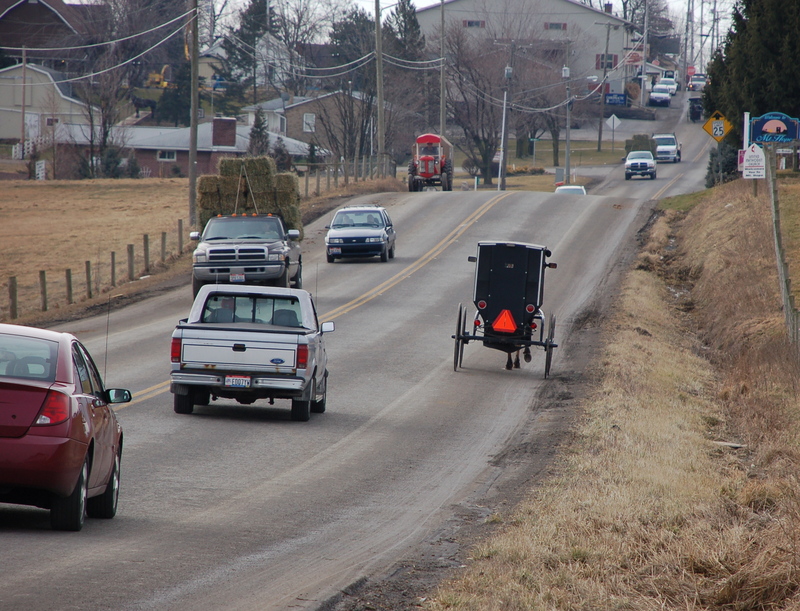 ODOT shares the money with county and township officials for local road improvement in areas where Amish live. The money is intended to be a monetary substitution for road improvements in lieu of paying gasoline taxes, which owners of motorized vehicles pay each time they buy fuel. 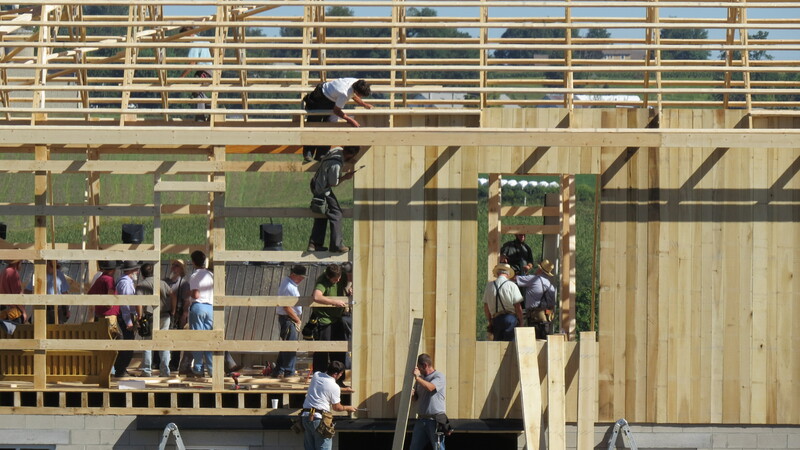 Donations by Amish families to the Ohio Dept. of Transportation help construct and maintain buggy lanes for safer traffic flow. This buggy was traveling near Mt. Hope, OH.